This "Historically Speaking" column was published in the Exeter News-Letter on Friday, July 4, 2014. The march and speeches were followed by a grand picnic somewhere in the shade. The day tended to end early, as everyone was still a bit sleep-deprived from the night before. Whatever the behavior of the ‘ancients and horribles,’ it served as a useful method of relieving some of the political steam during an era when political division was as acute as it is today. Perhaps we should consider reviving the festive mockery of costumed jesters to calm our current political tension. The 1879 parade seems to have been the apex of the tradition. Awards were presented to both individuals and teams – often the teams included wagons. As always, the event was held early at 6:15 AM in the town square. Led by the Exeter Brass Band and its leader for the day, Mrs. Vandersnoozlewoozle – who looked a great deal like Elbridge Watson - first prize was given to the team of Daniel Colcord “who presented an Oriental conveyance representing the elephant of the ‘greatest show on earth,’ ingeniously contrived with the riders poised a dozen or more feet in the air, a position few would care to occupy on such an occasion.” The prize for ‘worst looking individual’ was won by John Somes, who was dressed as a “bugler mounted on a superb and spirited charger.” Several other entries never got the chance to compete, as the horses involved refused to participate while in full costume. The practice of the Parade of Ancients and Horribles was waning in 1892 in favor of other, less mean-spirited events. And by this, we mean baseball. But old traditions die hard. When Chester invited Exeter to play a game on the fourth, it needed to be done with ceremony. 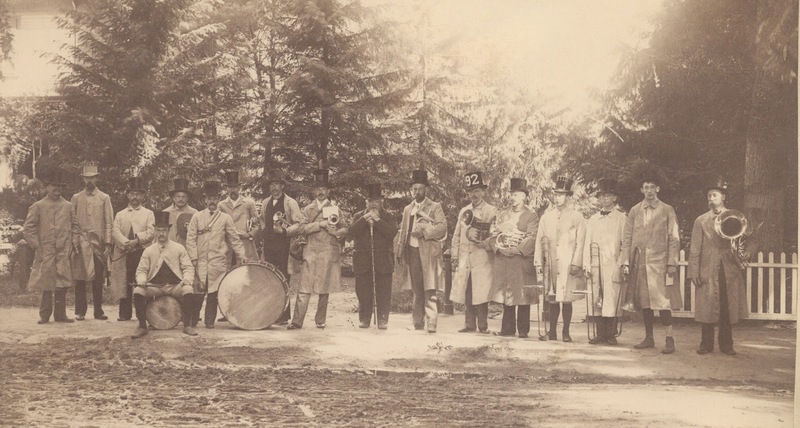 Photo: The Exeter Brass Band about to start for Chester escorting the Gentlemen of Exeter (baseball team) on July 4th, 1892.